Bathroom caulking is easy to do yourself. And the results pack a big decorative punch. Recaulking a bathroom is surprisingly easy to do yourself. Dingy, cracked, or mildewed caulk can make even a sparkling clean bathroom look dirty and unappealing. If you've resisted recaulking because it seemed like too big a job, hesitate no more. You can make this simple repair yourself, with little effort and minimal experience required. One of the common mistakes many people make when they notice that the caulking around a tub or shower stall has become stained or mildewed is to simply to spread a fresh layer of caulk over the dingy or crumbling area and call it a day. It does brighten the bathroom - for a week or two. Then the underlying mildew eats its way up through the new layer of caulk, treating the recent arrival as a little snack. Before long, you and your bathroom are back to dingy and crumbling square one. Here's how to do bathroom caulking right the first time. 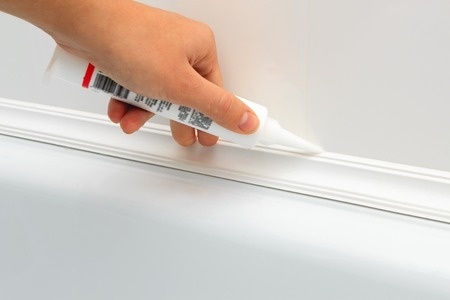 Although it may seem a daunting task, these step by step tips for removing caulk will take the mystery out of the process so you can easily do the job quickly yourself. The best way to remove caulking is to use a stiff putty knife and a small, inexpensive razor scraper. Using these tools, dig out as much old caulk as possible. The goal is to create a shallow groove is formed along the entire edge between the bathtub and the tile or the tub and shower surround. Thoroughly scrub the entire area with a bleach-based cleaner and a stiff-bristled grout brush . Rinse well, and allow to dry completely. To speed the drying process, temporarily direct a fan at the area. Once dry, fill in the groove with a latex-based tub-and-tile caulk (in either a squeeze tube or a caulking gun), with a thin, continuous bead of caulk. While the caulk is still fresh and before a skin starts to set and harden - within a few minutes at most - moisten your fingertip and use it to smooth the caulk out and push it through any gaps. Then carefully wipe away any excess caulk with a damp cloth.The trick here is to use the least amount of caulk necessary to fill the small gap between the two different materials and surfaces. It should be nearly invisible when complete, and not protrude any father than the tile or the edge of the tub or shower. Otherwise, it can act as a trap for moisture and allow mildew to grow. Let the caulk set for as long as the package directions indicate (it's usually overnight). Finally, you can probably avoid ever having to do this job again by regularly drying tub surfaces, shower walls, fixtures, and caulked areas with a clean towel. If stains do appear, clean with a mold and mildew killing grout cleaner .